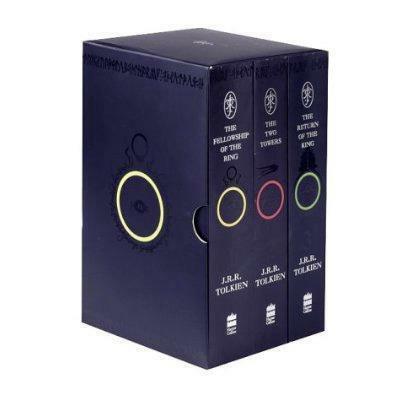 Continuing the story of The Hobbit, this three-volume boxed set of Tolkien's epic masterpiece, The Lord of the Rings, features striking black covers based on Tolkien's own design, the definitive text, and three maps including a detailed map of Middle-earth. Sauron, the Dark Lord, has gathered to him all the Rings of Power - the means by which he intends to rule Middle-earth. All he lacks in his plans for dominion is the One Ring - the ring that rules them all - which has fallen into the hands of the hobbit, Bilbo Baggins. Since it was first published in 1954, `The Lord of the Rings' has been a book people have treasured. Steeped in unrivalled magic and otherworldliness, its sweeping fantasy has touched the hearts of young and old alike. Edition Statement 2nd Revised ed.